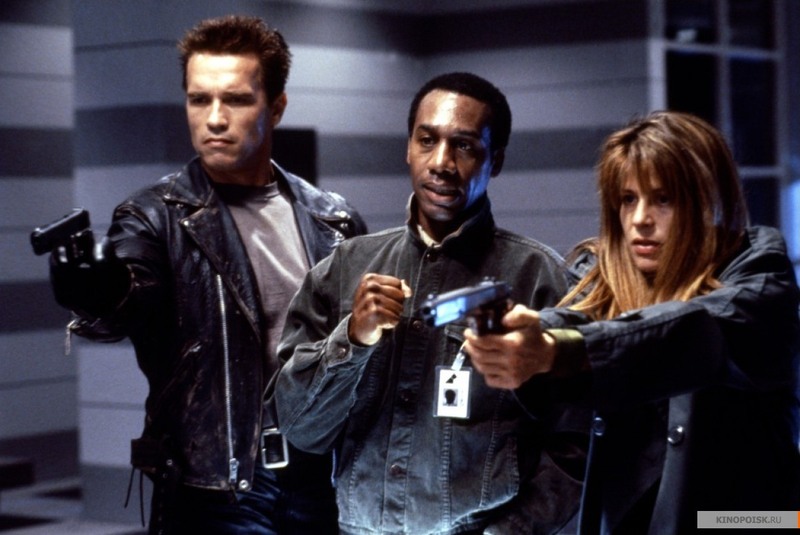 Noel: Terminator 2: Judgment Day cost an estimated $100 million to make—in 1991, no less—but what I’ve always liked about the movie is that for all its shiny special effects, it still looks like a sequel to the first Terminator, which was a $6 million B-movie. James Cameron worked with Roger Corman in the late 1970s and early 1980s, and learned a lot of of the tricks of low-budget filmmaking, such as finding cheap, empty locations rather than building sets. T2 has its share of undoubtedly costly locations, including the shopping mall where the T-1000 and T-800 first converge on John Connor, and the high-tech Cyberdyne Systems HQ. But just as much of the movie takes place in staple B-movie locations: a remote bar, a suburban house, featureless hallways, and the concrete banks of the L.A. River. The difference is that Cameron has the money to weave in more mythology, framing a simple chase story as part of something epic. But that doesn’t change that Terminator 2 is still, in most of its particulars, a 1970s exploitation movie. (And I don’t mean that as a knock, because I love 1970s exploitation movies.) Am I underselling what Cameron achieves here? Scott: You’re not underselling it at all, Noel. If anything, that exploitation-movie edge is what keeps the film from getting swamped by the somber messaging of its no-nukes agenda. T2 doesn’t incorporate its sociopolitical elements with anywhere near the grace of a movie like RoboCop, but it certainly delivers the goods on the action front, and those real locations you mention are key to their impact. The fundamental issue with CGI is that it lacks gravity—which is why it’s perfect for Gravity, a movie set in weightless space—but Cameron incorporates physical space so beautifully with virtual space that T2 almost becomes a new breed of action movie. One of the things I love about watching old exploitation movies is that they’re revealing of a setting at a certain place and time—think pre-Giuliani New York, for example—and Cameron turned T2 into a gritty document of early-1990s L.A., on top of everything else. Keith: The film really emphasizes the way the underpopulated nighttime Los Angeles of low-budget movies can feel kind of haunted, doesn’t it? Cameron was coming off the 1989 film The Abyss, which wasn’t terribly successful financially, and received mixed reviews. (Though I think it’s an interesting film, and critical opinion has done a bit of a turn-around on it.) There’s a sense here of getting back to his roots. Not that T2 looks like it was cheap or easy to make, but Cameron directs as if he’s trying to reclaim his old turf by making the biggest, loudest, and most exciting science-fiction/action hybrid ever made, and with the same spirit as the first film, which was made partly guerrilla-style because the production couldn’t afford permits. It’s a B-movie writ large, and I mean that as a high compliment. Matt: T2 looks like a blockbuster, but it still feels like an exploitation film. It earns its R rating with gritty, gruesome violence of the kind that would soon go almost completely out of fashion in big-budget summer movies. The T-1000’s brutal killing of John Connor’s foster dad, for example—impaling him and the milk carton he’s holding with one of his shiny metal spikes—is the sort of in-your-face imagery more associated with the drive-in than the multiplex. Sarah Connor’s dream sequence is another shocker: children turning to ash before they’re obliterated by a nuclear shockwave, and Connor’s own flesh getting flayed from the bone until she’s nothing but a shrieking skeleton. It’s nightmarishly explicit in that way only an excessively gory exploitation film can be. The way Cameron marries those ferocious images with glossy special effects and mainstream-friendly action and comic relief is a big part of what makes Terminator 2 unique. Tasha: But it also feels like one of those 1970s exploitation films in that it spends so much time on the “cheap” stuff—the characters talking, or driving, or Sarah regarding her son from a distance while her purple-prose analysis of the situation plays out in voiceover—between the expensive sequences where cars get smashed or computer effects take over. T2 is a weird hybrid in many ways, given its pricey execution and Corman roots, and its careful positioning between the practical and CGI eras in terms of effects. But it’s especially weird in that the pacing in the downtime is so languid and melancholy, as if Cameron was still responding to a Corman injunction to space out the money sequences as much as possible—even though this film has a lot more money sequences than a Corman film could afford. And those scenes also sprawl out, which explains why this is a 137-minute movie. It’s a 1990s movie still paced for the 1970s, in no hurry to zip past the chatty stuff to get to more explosions. Scott: James Cameron’s relationship with technology is fraught with contradiction. No director has done more to advance computer effects in the movies—T2 wasn’t just advanced for the time, it still looks better than the wave of CGI blockbusters that followed, even now—but his concern over where science might lead us is the film’s thematic backbone. While there’s a difference between technology as Cameron is applying it as a filmmaker and technology as it might be applied to world-destroying robots, there’s an underlying paranoia and distrust embedded in the film’s attitude about this kind of scientific pursuit. If there’s any real hypocrisy to the film, it’s in the way Cameron fetishizes some types of destructive weaponry while decrying developments that might bring about other forms of mass destruction. Cameron’s lecture on humankind’s abhorrent violent tendencies—cue shot of little boys fighting in slow motion with toy Berettas—is often hard to hear over all that cool gunplay. Is Cameron’s view of technology more coherent than I give it credit for being? Or is he trying to have his cake and eat it too? Noel: Well, it isn’t just guns. The way the T-800 tells John Connor about the T-1000’s ability to make its appendages all stabby makes him sound a little like a teacher in a 1950s juvenile-delinquent movie, clucking his tongue over these kids today and their switchblades. (Meanwhile, doesn’t that T-1000 look cool when it stabs John’s foster dad right through the milk carton?) I don’t know that any of this is hypocritical, so much as it’s just indicative of who Cameron is. As recently as Avatar, Cameron was still revealing himself as one of those hippie geeks who came of age in the 1970s, reading blatantly allegorical science-fiction novels and staring for hours at Roger Dean paintings. Fetishizing the “natural” and loving spaceships doesn’t seem too contradictory, so why would hating the military but loving the hardware? Matt: If Cameron’s a hypocrite, he’s at least a consistent hypocrite. Many of his films fret about the dangers of technology run amok, while fetishizing much of that technology by placing it at the center of pulse-quickening action sequences created with cutting-edge visual effects. In True Lies, Arnold Schwarzenegger hunts down terrorists who’ve stolen a bunch of nuclear weapons. And in Avatar, the villains are the technologically advanced humans who want to despoil Pandora and steal its natural resources. In an interview a few years ago, Cameron addressed this seeming contradiction by claiming that in his eyes, “Technology in and of itself is not evil, but there is a great potential for evil in the human misapplication of technology.” And that’s really what you see in the Terminator films. Miles Dyson and Cyberdyne blindly pursuing technological breakthroughs without any consideration of their implications leads to the Judgment Day war. On the flip side, the Schwarzenegger-Terminator, wedded to John Connor’s morality, is portrayed as a heroic figure. By the end of the film, he’s a Terminator who knows why John cries, and he willingly sacrifices himself to save mankind. Keith: To draw more films into this thread, Titanic is many things, including a tale of technological hubris. And what is Piranha II: The Spawning, if not… Okay, that may be stretching it too far. Tasha: Yeah, not even going to touch the flying-monster-fish movie. But I will note that Terminator 2 is on all sides a story about “good” use of technology vs. “bad” use of technology, and specifically about moral people making decisions that go against their own seeming interests, letting go of useful tools because of their destructive potential. Miles Dyson is so determined to get rid of the technology that will lead to the future apocalypse that he joins forces with the crazy woman who shot him, and her kid and pet killer robot. John Connor turns a killing machine (its purpose is right there in its name) into a kneecapping machine, which means leaving a trail of gun-wielding, injured, angry witnesses wherever they go, but at least lowering the body count and turning something evil into something slightly less evil. And to make sure no one gets their hands on any loose parts and messes up the future, the T-800 voluntarily melts itself down. (With a cheesy parting thumbs-up, no less. I see what Cameron is going for, but as an exit line, it doesn’t hold a candle to The Iron Giant’s “Superman…”) That doesn’t mean putting down comparatively harmless technology like movie special effects; it means letting go of the constant urge to build bigger and better weapons. It’s possible to find a movie explosion cool without torching the family truck yourself—or devoting your life to inventing a hotter, faster-burning twist on napalm. Cameron’s message is consistent enough about letting the actual harmful stuff go. Keith: James Cameron stepped aside after Terminator 2, but that didn’t stop the series from piecing itself back together drop by drop and reassembling itself for Terminator 3: Rise Of The Machines (directed by Jonathan Mostow), Terminator Salvation (directed by McG), a TV series called The Sarah Connor Chronicles, and many spin-off novels and comics, including a Frank Miller-penned series in which a Terminator met RoboCop. I don’t hate either movie sequel, honestly. Terminator 3 has at least one great chase scene and a cool downer ending, and Salvation… well, it’s my favorite McG film, a statement that probably defines faint praise. But I also think these first two films are such perfect companions, they make a great case for quitting while you’re ahead. There’s a complete story here, one that doesn’t really need to be expanded upon. That’s often true of movies that get sequels whether they need them or not. So is it just the disappointing quality of the Terminator sequels that makes them seem so unnecessary? The absence of Cameron? Something else? Tasha: For me, the main problem with the sequels has always been the unrelenting weariness of fighting the same grimly awful battles over and over and over. This is time travel; Skynet can keep sending Terminators after John Connor throughout every minute of his life, and every new conflict leaves him and his makeshift families more battered and traumatized. Any sense of victory in the series is Pyrrhic and fleeting, and comes with the understanding that it’s just a tiny battle, barely won, in a greater war. 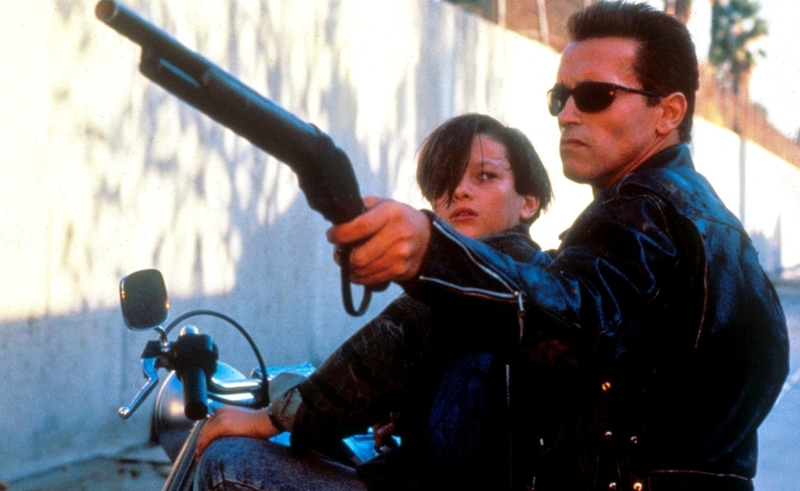 Terminator 2 is thrilling, and in its day, the scale and special effects felt unprecedented. But even back then, it was a joyless slog, especially for poor Sarah Connor, who starts the film so damaged that her personality has disappeared into paranoia, fury, and nightmares, and spends the rest of the film getting drugged and stabbed and shot over and over and over. The ongoing clash between flesh-and-blood and something unfeeling and nigh-unstoppable gets repetitive within the course of T2—so of course it gets even more repetitive over the course of four movies and a series. Noel: I think you’ve pinpointed the main issue, Tasha: They’re not “sequels” in the sense of continuing a story, so much as they’re quasi-remakes, retelling the same basic story with a few new cast members and characters. As much as I love the prologue to Terminator 2, with its detailed depiction of the miserable robot-controlled future, sometimes I think that opening was the worst thing that could’ve happened to the franchise, because it suggests a world that seems to demand further exploration, when maybe just the suggestion is enough. Matt: I’m of two minds about the sequels, beyond the sheer fact that they are clearly not of the same caliber as Cameron’s Terminator films. As Keith notes, there’s something to be said for Rise Of The Machines’ mega-bummer ending, and in the franchise’s best moments, the sad inevitability of the Judgment Day War lends the Terminator franchise the same kind of poetic fatalism as the other great/depressing time-traveling science-fiction franchise, Planet Of The Apes. On the other hand, one of the most powerful things about Terminator 2 is its message that the future is not written. Lines to that effect are uttered several times throughout the film, and seemingly confirmed by a finale where the Connors triumph and destroy all the remaining scraps of Terminators. Cameron’s original ending for T2 was unambiguously hopeful, with an old Sarah Connor narrating a scene set in a peaceful future. 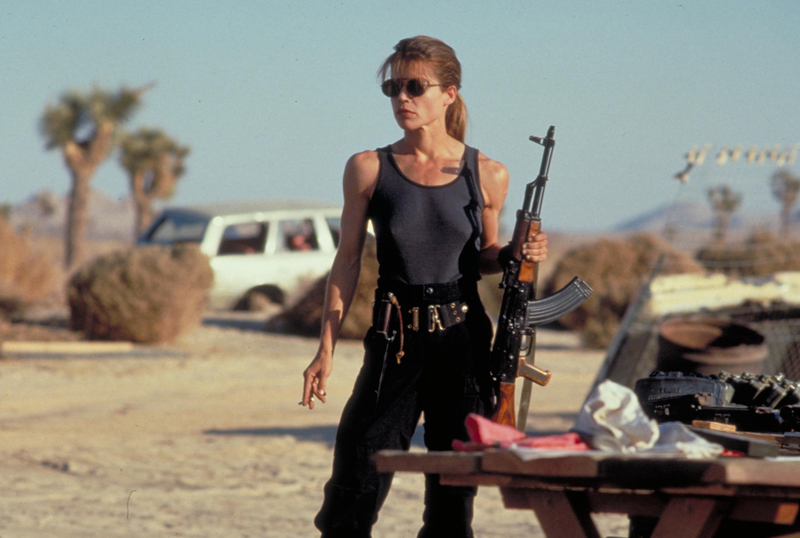 He later replaced it with more equivocal shot of a dark highway at night, though its Linda Hamilton voiceover still speaks of facing an “unknown future… with a sense of hope.” All of that is erased by the sheer existence of Rise Of The Machines and Salvation, which retroactively undercut what Cameron was going for in T2. Cameron was content to end his lucrative, popular series after two films; after all, if the Connors do prevent the rise of the machines, then there’s nothing to make more Terminators about. Leaving things open ensures the death of humanity and the strength of the overall franchise. That, even more than nuclear armageddon, might be the most depressing part of the later sequels—the idea that no matter what the heroes do, society will inevitably fall, not because of human nature, but because of Hollywood economics. Scott: Matt nails it here in talking about how the sequels undermine “the future is not written” message. The characters in T2 go through quite a bit of trouble to make sure the robo-pocalpyse doesn’t happen, but that isn’t enough. They also have to destroy the lab, and destroy the artifacts that might lead other scientists to the same place, and destroy the Terminator himself. These are all hard-won challenges with an unambiguous ending; seeing the threat emerge again in the sequels—or reboots even, if that’s what we want to call them—is deflating in the extreme. Even amid the many digital effects, bravura stunts like that one give Terminator 2 a tactical reality that’s missing from many modern blockbuster spectacles. Rather than trying to disorient viewers with frenetic imagery and cuts, he blows their minds with awesome but coherent spectacle. How do you guys think the action holds up? And what are your favorite scenes and shots? Tasha: There’s a certain stately clunkiness to many of T2’s big action shots, because at the time, the practical requirements of ramming a semi-truck through a series of moving cars, or driving it off an overpass, meant getting the camera well out of the way, and holding the shot long enough that you didn’t miss the expensive, expensive crash. So a lot of the big smashup sequences are shot the same way: with a static long shot, positioned so the vehicles move toward the center of the frame for impact. It doesn’t feel rigid, because there’s always motion onscreen, and it’s hard to call a shot “rigid” when it’s packed with crashes and explosions. But as you say, it’s certainly notable how it’s possible to count the seconds in each shot, instead of seeing them blink by faster than the mind can process. I’m watching my favorite sequence now—that first chase, where the T-1000 pursues the Terminator and John through the drainage canals, in a truck that loses parts until it gradually gets whittled down to one flaming, rolling wheel—and my count sometimes hit to seven or eight seconds in a single shot. It’s not master-shot cinema, but it feels like it compared to today’s action. To some degree, that action doesn’t hold up, because it’s limited by practicality and physics—no nonsensical Drive Angry business here, with people casually walking along those semi trucks as they crash into other vehicles at 90 mph—and it feels carefully orchestrated, more like watching ballet than watching someone spontaneously rock out on the dance floor. But there’s so much enjoyment for me in watching these action scenes and thinking, as Cameron notes, “That really happened. They really made that physically happen.” There’s a gravity there that the much vaster CGI spectacle of today is missing. Keith: We’ve been talking about how T2 falls in a sweet spot between two types of special effects, and I think it finds a similar sweet spot with its action scenes. Cameron brings a classic sense of pace and editing to the action scenes, but he’s not afraid to throw in flourishes like that close-up of Schwarzenegger’s boot crushing the rose, and moments captured in slow motion. I don’t know if Cameron has ever cited John Woo as an influence, but that sequence seems Woo-like to me. It’s possible it could be parallel thinking from two men who admired Sam Peckinpah, but either way, the action scenes suggest a director who’s not content doing things the way they’re usually done, and who’s eager to try new things. Noel: If there’s a third thing about T2 that looks dated, it’s the T-800 walking out of a biker bar while “Bad To The Bone” blasts away on the soundtrack. Seriously, though, what I love about those early chase scenes in T2 is how much they impart information visually, without having any of the characters narrate the action. I’m thinking here of the scene in the mall, where the T-800 shoots the T-1000, and we see the metallic holes open up in the T-1000’s chest, before we know what the hell what we’re looking at. (It looks at first like the T-1000 is wearing a tinfoil boutonnière.) That’s a remarkable act of trust on the part of an action filmmaker, to be certain that shot-construction alone is all the audience needs to follow along with what’s happening. Tasha: I’m glad that particular image wasn’t explained, but it’s always been my least favorite aspect of the movie, because as the T-1000 continues to get shot up, the holes do look like external tinfoil boutonnières, rather than like actual holes in its body. They’re clearly practical effects—metal funnels attached to Robert Patrick’s chest—and they’ve always looked fake to me. Besides, it’s a repetitive effect that we get over and over, in a film that’s mostly about a wide variety of action sequences, and that’s openly about the flexibility of the T-1000 in combat: Every time it does something new, like splortch its way through a barred door, or reassemble after being shattered, that’s terrifying. Every time it does the same thing it did before—like taking a bullet and walking away with a new boutonnière—it cheapens the action a little. Scott: If T2 came out today, I think we’d still talk about how good the effects are; it’s astonishing to consider that 23 years have passed, and we still haven’t seen a CGI creation as menacing as the T-1000, which could function as a metaphor for computer effects themselves—defiant of physical law, capable of morphing into anything, relentless in their deployment. But there’s none of the weightlessness I associate with CGI: The T-1000 is terrifying and unstoppable. And the T-800 has no answers for him: “Hasta la vista, baby” isn’t the last goodbye. As to Tasha’s point about the action being “limited by physicality and physics,” these are the sorts of limitations that give action movies their impact. Without them, there’s “chaos cinema,” which is the type of term that doubles as its own criticism. Tasha: We haven’t talked at all about the human side of this film, which seems like a major oversight, because for all the explosions and killer robots, this is such a human-centric series. The first Terminator was a tragic love story, and T2 is a tragic family story, about a boy trying to protect his mother and hang onto the closest thing to a father figure that’s entered his life. After 1986’s Aliens, action movies were suddenly aware of the power of the angry-mama-bear dynamic, and T2 wasn’t the first or last film to seize on those lessons. But as far as I know, it’s the only one to really psychoanalyze the mama bear, and show how her protective drive gets in the way of connecting to the child she’s protecting, to the point where she actually abandons him in order to go commit murder. When she can’t bring herself to kill her target—to protect her family by destroying another family—and John catches up with her and tries to comfort her, it’s one of the film’s most heartbreaking moments, because she seems so far beyond comfort. I get the sense that Ripley’s Alien experience toughened her, but Sarah’s Terminator experiences destroyed her, and John’s constant childish attempts to get around that and find her humanity are an awfully heavy burden for such a young kid to bear. Keith: Matt brought up the original, more definitively happy ending above. Beyond its incredible cheesiness—bad makeup, worse costume design—I think the only real improvement it would have offered would be to close the door to any sequels. I like the ending the film ended up having, and a sense that the future might be set, or might be unwritten. It’s the question in the background of Terminator and its predecessor, and it’s better left unresolved. Noel: Maybe it’s because I have this story on my mind lately, but re-watching T2 this time, I think it’s a better adaptation of the X-Men comics’ “Days Of Future Past” arc than the official version that came out this summer. That non-assassination scene Tasha mentioned is a great example of what I mean. Even if the goal is to secure a better future, it’s not easy to look an otherwise-innocent person in the eyes and then murder him, especially if there’s no guarantee that this will fix everything. That’s the situation that the X-Men comic illustrated so well, too, capturing dread, uncertainty, and how epochal events affect human beings. Scott: No talk about the voiceover narration? The lines themselves are clunky enough (e.g. “The future, always so clear to me, has become a black highway at night,” or the movie-closing “If a machine can learn the value of human life, maybe we can too”) without Hamilton’s grave intonation making them land harder. What struck me about T2—and the majority of Cameron’s films, for that matter—is that it survives his writing. He’s that good a storyteller and that good a filmmaker; others would just hit an iceberg. Matt: It’s worth noting the uniqueness of Schwarzenegger’s flip from villain to hero between the first two movies. Viewers were scared of the original Terminator, but they also liked him because he was tough and cool, and he said funny deadpan lines like “I’ll be back.” Looking back through the pop culture of my 1990s teenhood, I see several similar characters who were introduced as villains, and then, through sheer force of popularity, became violent antiheroes. In comics, Spider-Man foe Venom became such a bestseller as an antagonist that he was given a series of comics to headline where his perverse moral code and his obsession with protecting the innocent made him an unlikely good guy. (The subtitle of the first of these miniseries, “Lethal Protector,” is the perfect descriptor of the T2 Terminator.) A few years later, a pro-wrestling heel called “Stone Cold” Steve Austin, so named for his penchant for in-ring brutality, suddenly became the biggest fan favorite in the WWF, even as he was feuding with established babyfaces. Historians often refer to the 1970s as the age of the cinematic antihero, but something about these characters struck a chord with young audiences in the 1990s. Yesterday, Tasha Robinson launched our Terminator 2: Judgment Day conversation by giving away the ending of the film’s spoiler-laden marketing. Tomorrow, Chris Klimek concludes with a look at the Los Angeles Police Department as villains, in this film and elsewhere.